Whenever the President looks out from the North Portico side of the White House, he can see his nearest neighbor seated in front of the white tent of the Peace Vigil. Its plastic canvas is silhouetted against the lawn of Lafayette Park, which is lined with tulip beds and stately elms. The tent is flanked by two large white signs standing over it like guards, displaying photographs of the Hiroshima and Nagasaki nuclear bomb aftermaths. The black and white photos illustrate the graphic carnage of the end of WWII when the US nuclear bombings extinguished tens of thousands of lives in milliseconds and ushered the age of atomic warfare. Other protest items surround the tent on the red bricked sidewalk: stones painted with a peace sign, ‘no nukes’ and ‘Palestine’ written in Arabic, various anti-war signs, and a bucket for donations with a dollar bill clipped at a thin opening. At the tattered tent door sits an activist greeting tourists. “Welcome to the protest for world peace peace and against nuclear weapons,” says Philipos Melaku-Bello, his long dreadlocks hanging like a waterfall around him. On any day there are hundreds of tourists coming to see the White House, while others pause to take photos with Melaku-Bello. Some chat while others just gaze at the concoction of signs of dissent splayed close to the home of the President. The Peace Vigil is anchored in its place like an immovable stone, 24 hours a day, 365 days a year, as it has since 1981. It quietly faces the doors of the White House, refusing to go. Like a bug in the eye of power, and a burr in the foot of the cyclops, it stands as a resistance to war. It’s right to be here is enshrined by law, the grandchild of dozens of court battles fought in the 1980s and 90s by its founder, William Thomas. After 36 years its presence has become more of an act of dissent than a protest. None of the six presidents that have lived across from it, Ronald Reagan, George Bush Sr, Bill Clinton, George Bush Jr, Barak Obama, and Trump, have acknowledged or acted on its message to forever eliminate nuclear weapons. Melaka-Bello sits in his wheeled chair, talking to tourists about its purpose there and why it is important to disarm nuclear weapons before it is too late. He speaks to tourists in a friendly manner about hope for world peace but privately he expresses fear that time to act has all but run out. And he has much reason to worry. As tensions between three main superpowers increase in both the South China Sea and in Syria, the likelihood of a war between them means the possibility of nuclear war is also rising. There are over 10,000 nuclear weapons worldwide and the number of sovereign states having them is growing as well, now at eight. Iran is likely to have a nuclear capability within three years. At the 35th anniversary of the Peace Vigil activists celebrated the milestone with a peace cake. They shared the cake with the public along with stories about their experiences over the many years they’ve stood watch there. Nobody expected the vigil to last this long. The activists spoke about the anti-war protests they took part in over the years, including protests of the Gulf War, the Iraq War, the Somalia Conflict, The Darfur Hunger Strike, the Syria War, and a dozen other campaigns they fought over the three decades they have been there. On June 3, 1981, William Thomas began a nuclear weapons protest outside the White House when vehicle traffic still passed by the White House on Pennsylvania Avenue. For years the Department of Interior wouldn’t issue him a permit to stay there. His plan was to stay on the sidewalk, no matter what, just outside the White House by its iron fence. As the vigil continued he was repeatedly arrested for camping but challenged the Park Service in the courts over its attempts to remove him. Thomas formed Proposition One Committee of Washington DC, in the 1980s, a non-profit organization dedicated to removing nuclear stockpiles. Proposition One participated in years of activism and dozens of panels about nuclear weapons proliferation and reduction. In 1994, Eleanore Holmes-Norton introduced the Nuclear Disarmament and Economic Conversion Act, partly as a result of years of work by Proposition One. She reintroduced it every year, though it was not passed, until 2011. The thirty six year duration of the Peace Vigil has come at a high cost. Two activists have given their lives for it, Thomas, who died in 2008, and Concepcion, who died in 2016. Hundreds more have dedicated long hours at its tent, accumulating over 314,000 hours of activism. The vigil has become an institution, of sorts, recognized by many who return, keeping constant watch over the White House and with it, a symbolic eye of the Executive Branch of the US government. It is visited by thousands of tourists weekly who look in on its tent and occupant. It’s tattered tent and occupants have persevered through Summer heat, frigid Winters, hurricanes, blizzards, and police scrutiny. It has been attacked many times by those angered by its anti-war message. No president has visited the vigil, or publicly mentioned it. At least that’s what Melaku-Bello says when asked if any president has ever come out to visit him. He replies “No”, but he speaks on this subject with a wry smile beneath his beard. And perhaps there’s a hidden story wanting to be told. He admits that a recent President he refuses to name, sent out Thanksgiving dinner to the activists with several $100s taped to the bottom of the plates. The money was used to pay for hand warmers and winter clothing. There is no doubt that every president has gazed at the tent from time to time across the White House lawn. What is not known is if the Peace Vigil has caused a President to consider what its message is, or influenced policy on the nuclear issue. In 1981 when the vigil began, the Cold War was already four decades old. The silent war became known as the Cold War because it was a period when there was no direct war between the US and USSR but acute dipmatic tension with periodic confrontations. But in the background there were fears that a nuclear war could break out in an an instant. And several times such war nearly happened. There was the Cuban missiles crisis in October 1961, twenty years before the vigil began. In that year the Kennedy administration went toe to toe with Nikita Kruschev over short range nuclear missiles the USSR was secretly installing in Cuba. The standoff came very close to a nuclear war when US battle ships intercepted Soviet ships off the coast of Cuba. Nuclear war was avoided after Soviet ships returned to homeports and nuclear missiles were removed from Cuba. The incident resulted in establishing a military hotline between the two powers so better communications could reduce misunderstandings which could lead to nuclear war. Neither side really wanted a war because it would be so devastating to both sides. And for a time it seemed to reduce the likeliness of a nuclear war. But in the aftermath of the standoff, both powers began assembling even mightier nuclear weapons arsenals in a headlong race to prepare for the possibility of nuclear war. Within five years, by 1966, the US had doubled its nuclear weapons stockpile to 31,000 and the USSR increased its by six times to 7,000. In 1979 NORAD almosted launched nuclear weapons after a training scenario was erroneously loaded into its control computer. In 1983 there was another serious close call when the Soviet Union incorrectly concluded the US had launched nuclear weapons towards it. The incident happened in the late afternoon of September 26, when Soviet radar misread reflected radiation off clouds from the setting sun. A Soviet Colonel stopped the launch order because he reasoned the US would launch hundreds of missiles, not just five missiles, as the radar reported. If not for his gut feeling, the Soviet Union would have ordered-in error-a massive launch against the US. In November 1983, NATO war games known as Able Archer 83, nearly caused another Soviet nuclear launch when Soviet President Yuri Andropov thought the US and NATO was preparing a sneak attack from Europe. It was the possibility of close calls over misunderstandings that motivated William Thomas to continue his protest. Tens of thousands of nuclear missiles would be the end result of the trigger of such a war. 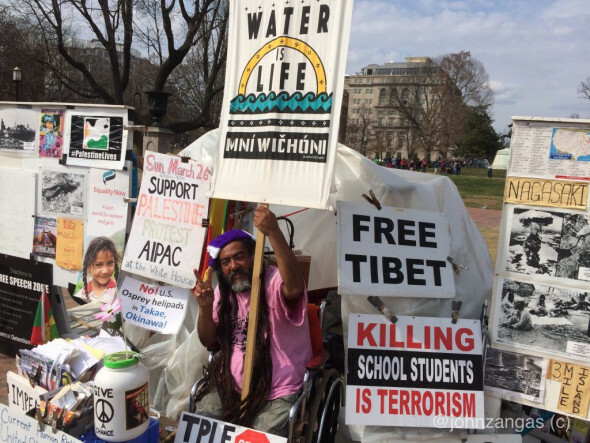 He dedicated his life to the vigil, talking to tourists outside the White House until he died in 2009-though he’d been arrested “dozens of times for camping,” according to Ellen Thomas, his wife and cofounder of the vigil. The vigil itself nearly ended in January 2016 when its longest serving activist, Conception Piociotto died at 83, having sat at the vigil for over three decades. She was with William and Ellen Thomas almost from the beginning, helping to staff its shifts. Piociotto took over after William Thomas’s death and after Ellen Thomas left the area. It was Phillipos Melaku-Bello who held down the peace vigil after Piociotto died, working a marathon of back to back shifts for several months from January to March, 2016, before he could organize a new team of peace activists to keep it going. Most of the limited donations go towards transportation and food while he sits the watch. A small income holds him over for other expenses. But the donations he needs arent coming in fast enough and most of the costs are out of pocket. He is unpaid as all the volunteers are but their dedication to peace keep returning them to the Peace Vigil. There are good weather days when hundreds pass hourly, looking to it’s white plastic tent flaps and signage. “Free Tibet”, reads one sign, “War is Not the Answer, Peace” reads another. Mini Wiconi (Water Is Life) reads yet another and it’s the one Melaka-Bello holds in his hand. Many tourists remain back cautiously observing, while others muster courage and approach the tent. Melaka-Bello always greets them nicely and tells a story about its founder, William Thomas. And like the activists before him, he always holds his fingers in a sign of peace for photos. Some visitors remember seeing Concepcion years ago but forgot her name. “I came here when I was a student 25 years ago and there was a lady here…what was her name?” asks an African man from Gabon. “Conception,” says Melaku-Bello, “Shd died last January and I’m here now,” he says. The man thanks him for keeping the vigil and they chat a while. The man leaves a dollar in the white barrel and poses for photographs with his family and Melaku-Bello. 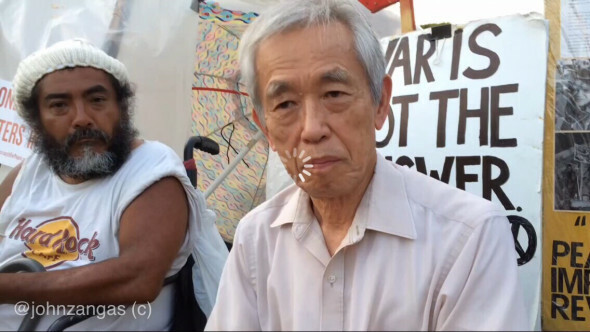 A prominent activist named Kio Kanda, 81, sometimes sits at the Peace Vigil. Kanda was 10 when he lived in Hiroshima Prefecture, Japan, on the day Hiroshima was bombed. Although his city was 50 miles from the blast, he remembered that day. “On that particular day I saw wounded people coming into our city. I knew it was bombed,” said Kanda. But he added he did not know it was a nuclear bomb. “Nobody knew what a nuclear bomb was,” he said. But the issue is much more than one of nuclear weapons, believes Melaku-Bello. “We have Chernobyl and Fukushima to remind us that,” he says. On this late afternoon in April the sun is beginning to set and shadows of elms are creeping over the tent flaps. The crowds of tourists begin slacking off. But for Philipos, there are another three hours before his shift ends and a replacement comes. And there are uncounted days and perhaps years before someone else takes over for him for good. I strongly commend these people. That said, what is the vigil a “warning to?” Does the writer mean, a “warning of…?” I think most adults know the potential danger of nuclear war. Some (myself included) understand why the US — all of us — would lose. Those in power are clearly aware of the strong opposition to nuclear war, and they’ve been unconcerned about this opposition for years. Early yesterday afternoon, I read the AP report that begins: “U.S. forces in Afghanistan on Thursday struck an Islamic State tunnel complex in eastern Afghanistan with “the mother of all bombs,” the largest non-nuclear weapon every used in combat by the U.S. military…” It’s said to “unleash 11 tons of explosives.” This is a very big deal, and I thought it would dominate the news and public discussion. Other than a single citizen’s comment on a discussion board, I didn’t come across any mention of it after that AP report. I wondered if such an unimaginable force of destruction is viewed as not-so-bad as long as it isn’t nuclear. Or maybe we’ve reached the point where the “masses” have concluded that everything is out of our control, that there’s nothing we can do to stop the madmen who took over our government. There appears to be no opposition party today, and We the Ordinary have been hit with a series of crises, one after another, over which we’ve had no control. This, in fact, is now the norm. We occasionally see notice (not in MSM) of “mass protests” for/against this or that, and petitions come fast and furious, but the fascists (by definition) are disinterested. They have their agenda, and now have the money and means to pursue it. Yes, there have been numerous warnings about the threat of nuclear war. Most informed people understand the horrific possibilities that may await humanity. Yet, with an unstable, unhinged person in the White House, I despair over what may occur whether it be with North Korea, Iran, China, or with Russia. (Did I leave out India versus Pakistan)? And, what of Israel with its some 200 nuclear weapons? Those who are able to protest, physically, out in the streets, must do so. Others may write to our elected Congresspeople and/or phone their offices. Action needed. Now.